It’s been a little late coming but our garden is finally starting to come to life with the beautiful spring weather. Each year we do a little bit more to our small outdoor space and it is such a haven. Neither me or my husband are gardeners by any stretch of the imagination but we are learning as we go; last Autumn was the first time I remembered to plant bulbs for the coming spring and in the last few weeks I have been rewarded with the alliums starting to open up. The tiny apple tree has started to blossom, despite the fear it had died off and I’m adding yet more climbers and lavender as I do every year. I love it out there but it isn’t pristine – we have three small children and they have as much claim to the garden as we do. We constantly find toy cars in the flower beds and there is an ever growing pile of sticks and stones that they pick up whenever we go for a walk. 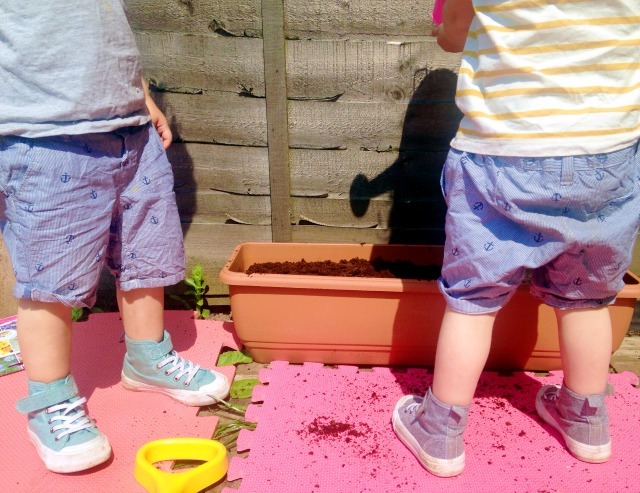 I love that they get stuck in whenever we are doing any work out there, they are never as happy as when they can dig in the flower beds and come away with mucky hands and knees. 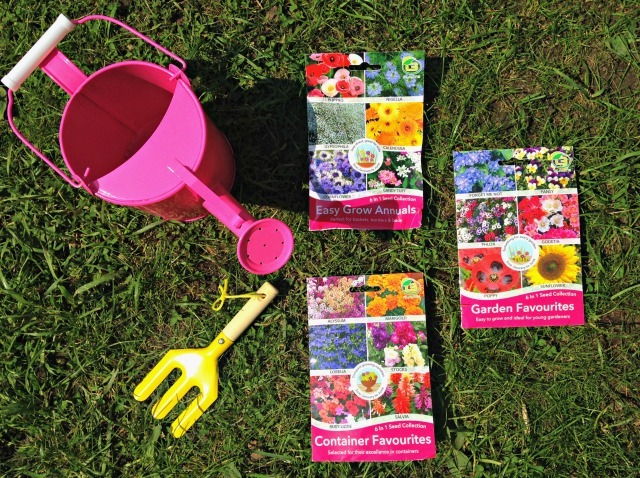 We were recently sent a fantastic box full of gardening treats from Home Bargains which has provided so much fun on the sunny afternoons. Home Bargains is one of my absolute favourite bargain shops; I often just pop in there and come away with a bag full of things I couldn’t resist! 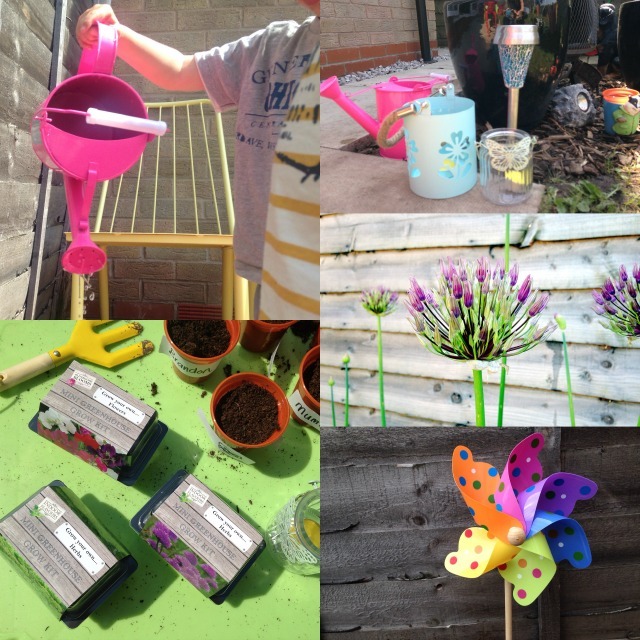 The boys loved getting out several packets of seeds, a child-friendly gardening tool and a very pretty watering can that Boo has taken quite a shine to. I had hoped to turn it into a flower pot as I love the bright colour but I don’t think I can now! 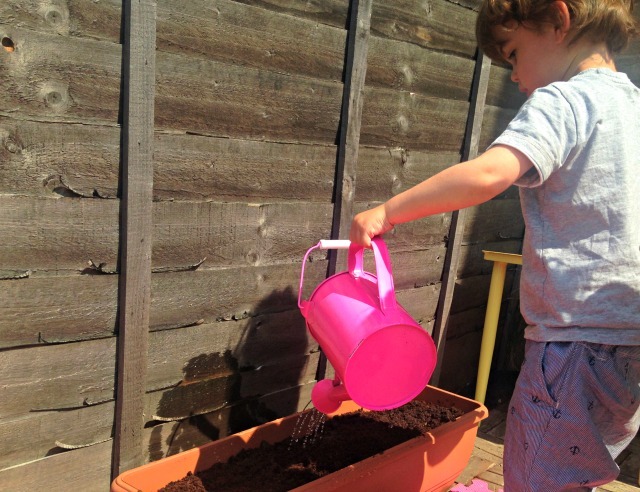 We had a wonderful afternoon in the garden while they scattered the seeds and watered the plants then when big brother came home we planted sunflower seeds in smaller pots so we can see which grows the fastest. Lucas added the rain gauge and windmill, both from Home Bargains as well, to our planter and is watching over the green shoots that have started sprouting. We were also sent three cute little mini greenhouse sets; parsley, chives and sweet-peas which the twins planted and are now sat on our kitchen windowsill. 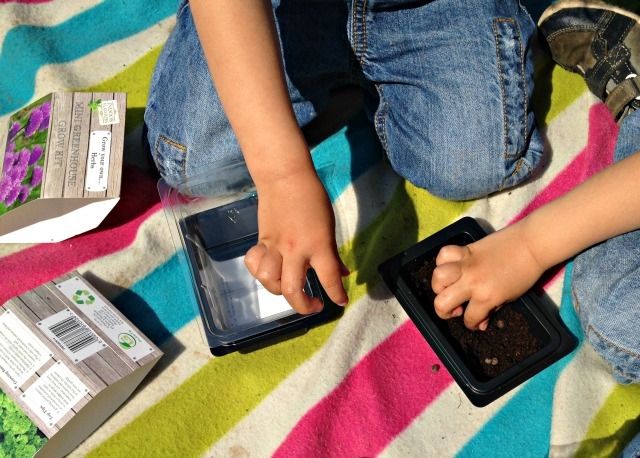 These were all so easy to plant with the little ones. Probably my favourite thing from the range are the citronella tealight candles and the pretty candle holders. 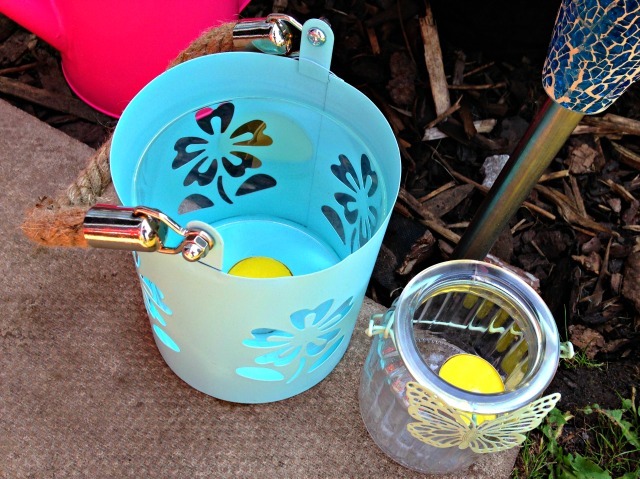 We get a lot of wasps around the front of our house so when I open the kitchen window I pop the butterfly tealight holder in there with a citronella candle to keep them at bay. So far so good and I’ve already been to buy more of the candles. There was also a lovely, light blue, candle holder with a big chunky rope handle which I must confess I have kept in our living room but on summer evenings I will bring it outside. I’m not great at sitting out in the sun, it’s too hot and I get bored but I love the evenings as it cools down and I can sit out there with a glass of wine – it’s is one of my all time favourite things about summer! We were sent a blue mosaic solar garden light which I am definitely going to buy more of, the light it gives off at night is quite subtle and they look just as good in the day as the sun bounces off it. There are still a few jobs on our garden list for this year – paint the fences, extend the patio and we desperately need a new garden table. I’m keeping my eye out for a pre-loved find so hopefully I’ll be able to do another update soon. For now here are a few photos of the garden as it is – our garden in the spring. 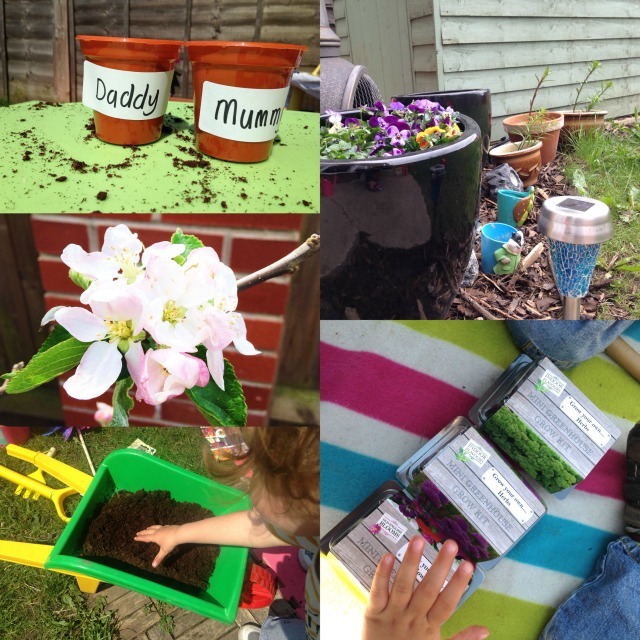 Thank you to Home Bargains for the lovely box of things for our garden – we have enjoyed putting them to good use. I had no idea Home Bargains did such cute gardening stuff. I really want to plant a sunflower with Z. I wonder if it’s too late!